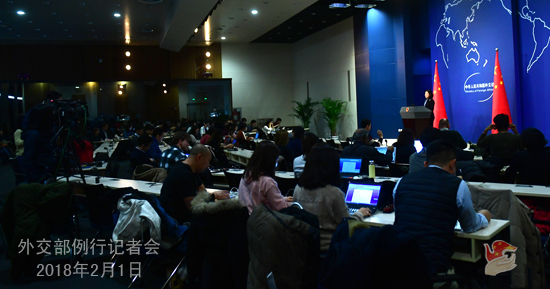 Q: First, Xinhua News Agency today launched its Japanese-language news service in Japan. It is only natural and legitimate for national governments or media to strengthen information dissemination to other countries and should be welcomed. But in China, the webpages of most Western media and Japanese media cannot be opened. What is in question here is the principle of reciprocity. What's your response to this? Second, catalogs published by the Japanese company MUJI were ordered to be withdrawn because of faulty maps. China's map management regulations stipulate that maps to be made public must be submitted to related administrative authorities for review, but simplified maps are an exception. As far as I know, the maps used by MUJI is meant to indicate the number of its stores, containing no geographically professional and specific information. For foreign companies, this provision puts in place a very vague standard. Is the map on the wall behind you also reviewed? 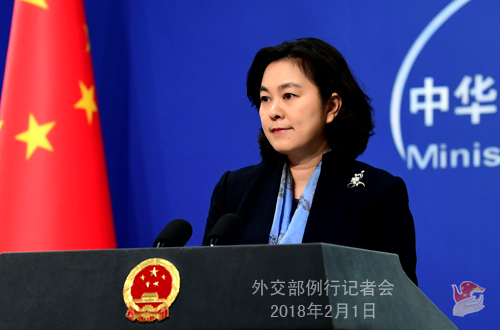 Third, let me say a few words about your statement on the report of the Foreign Correspondents' Club in China (FCCC) on January 30. On that day, you asked for a show of hands if any reporter in the room agreed with the contents of the report. The thing is that no reporter from Sankei Shimbun participated in the press conference on that day. Now, I am here and I want to say that I agree with that report. Because we have personally experienced some of the situations mentioned in it, and we also expressed our hope that the Chinese side should make some improvements. This is our position on this issue. A: I don't know how regularly you attend the press conference. At least you were not here for a couple of days. I can see that today you've come "well-prepared". On your first question, to be frank, I don't quite get your point. But obviously what you asked about is outside the remit of the Foreign Ministry. So, whoever is responsible for that, you may go and ask them. On your second question, I gave my reply yesterday. China's position is very clear. I noted that MUJI said in an interview that the company has dealt with this matter as required by relevant Chinese department and given a serious reading to all the laws and regulations. I also want to refer you to the notice published by the National Administration of Surveying, Mapping and Geoinformation of China which made it clear that it was a general survey targeting no particular foreign company. China welcomes foreign businesses' investment and operation in China, but all of them shall abide by China's laws and regulations. On your third question, I wonder how many of the nearly 600 foreign journalists in China joined the FCCC. You said you agreed with the report, then I assume you are one of its members. I'd like to ask you a few questions. Why other media haven't met the problem you mentioned? Why does Sankei Shimbun feel that way? Don't you think it is how you behave sometimes that needs to be reflected upon? I believe, when the majority of foreign journalists and press can carry out their work and coverage smoothly in China, but you Sankei Shimbun alone has met problems, then you yourself need to do some self-reflection and self-examination. All the foreign journalists are our friends. We hope that what you write and what you capture on your cameras will present a China that is real, multi-dimensional, and comprehensive. We hope that you, as bridges between China and the world, could help enhance two-way communication and increase mutual understanding and cooperation. We welcome and support all your positive efforts to that end. Q: Director of the CIA Mike Pompeo told the BBC that China is trying to steal US intelligence and exert its influence secretly around the world. Australia also said it is now facing unprecedented infiltration and espionage threats and its intelligence agency listed China as an "extreme threat". What is your response? A: These reports remind me of a Chinese saying, one's mentality will determine how they see the world. It doesn't surprise me in the slightest that such remarks were made by a person who heads the world's largest intelligence agency. Besides, let's not forget that facts speak louder than words. Because if we have a review of all kinds of disclosed information, it is easy to see who is doing the massive spying, monitoring, espionage and infiltration thing and who is doing whatever necessary without holding anything back to maintain and exert its influence. As for the Australian intelligence agency listing China as an "extreme threat", if some individuals in Australia choose to believe that those several million-people traveling to and fro between China and Australia as well as the Chinese living in Australia are spies, then I can understand their nervousness and anxiety. They have every reason to be so. Q: Recently the Syrian National Dialogue Congress was held in Sochi, Russia, which issued a statement saying that all the participating parties agreed to establish the Constitutional Council. What is your comment on the outcomes of this congress? A: The Syrian National Dialogue Congress in Sochi is an important step to promote reconciliation among all relevant parties in Syria as well as a useful supplement to the Geneva peace talks. China congratulates the Congress on achieving positive outcomes. Ambassador Xie Xiaoyan, Special Envoy of the Chinese government on the Syrian issue, attended the Congress. 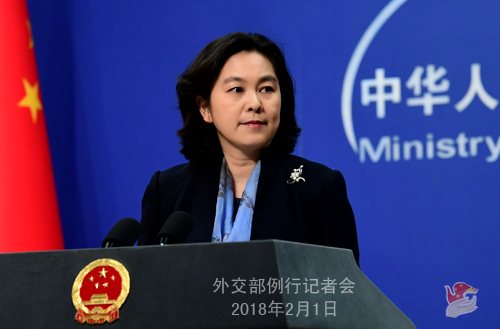 China stands ready to join hands with other members of the international community and continue with its positive and constructive role in promoting the political settlement of the Syrian issue. Q: Australia has just announced tougher restrictions on foreign buyers of agricultural land and electricity infrastructure amid fears of rising Chinese influence. I was wondering what's China's position on Australia's new restrictions and is it worried this targets Chinese investment? A: The Chinese government always asks its enterprises to abide by local laws and regulations as well as international rules when investing and operating overseas. Meanwhile, the relevant country should also create an open, fair and transparent environment for Chinese enterprises. We hope that all parties could join hands in creating favorable conditions and environment for normal business cooperation. Q: According to some media reports, after the recent National Defense Strategy of the United States identified Russia and China as its competitors and the major challenges for the national defense of the US, the Pentagon is in the opening stage of "redesigning the force" around the challenges of Russia and China. Some Pentagon officials said that the US should prepare different plans for possible conflict with Russia and China, because the fight with China would be largely maritime and air fight, while in contrast, the fight with Russia would be a largely air and ground fight. What's China's comment on these declarations and plans for possible conflicts with the two countries? A: We have already given our response to the China-related contents in this report issued by the US. China and the US share a wide range of common and important interests, and we do have our differences. But we shall not lose sight of the fact that our common interests far outweigh our differences. The past and present has shown that cooperation is the only right choice for China and the US. We hope that the US can cast away such outdated notions as the Cold-War mentality and zero-sum game and view China and China-US relations in a correct way. It is important for the two sides to work together on the basis of mutual respect, focus on cooperation and manage differences so as to ensure the sound and steady development of China-US relations. As for the report's take on Russia, we believe that Russia and the US, as two major countries and permanent members of the UN Security Council, shall properly handle their differences on the basis of equality and mutual respect, and jointly maintain world peace and stability, which serves the interests of the two countries as well as those of the whole world. Q: According to reports, the British Prime Minister's Office confirmed that when Prime Minister Theresa May meets with President Xi Jinping this afternoon, the present that she plans to give President Xi is the Blue Planet II, a documentary series produced by the BBC. Some people believe that the significance of this gift lies in that China is playing an increasingly important role in global environmental affairs, especially after the US withdrawal from the Paris Agreement. What is your comment on this gift and the significance behind it? A: I think you are better-informed than me. I really have no idea what present Prime Minister Theresa May is planning to give President Xi this afternoon. As to your question about why Prime Minister Theresa May chose this gift, you'd better ask relevant British officials. We all know that in recent years, China has played an important and positive role in addressing climate change. We are willing to continue with our positive efforts to better tackle climate change and protect our planet along with other members of the international community. This afternoon, President Xi will meet with Prime Minister Theresa May, and so will Chairman Zhang Dejiang of the NPC Standing Committee. The relevant press release will be issued in a timely manner. We hope that, through Prime Minister Theresa May's visit, China and the UK could step up mutual trust and expand practical cooperation in various areas. As her visit proceeds to this stage, you must have felt the strong and positive willingness on the British side to enhance all-around cooperation with China. We believe that stronger China-UK practical cooperation in various areas will definitely benefit the two sides. The major country diplomacy with Chinese characteristics for the new era is rooted in our national realities and people's aspirations and serves development at home. In light of this, starting from this year, the Ministry of Foreign Affairs will present Chinese provinces, regions and cities to the world under the theme of "China in the New Era". We will present a real and multidimensional China in an all-around way by introducing the latest socioeconomic development, cooperation potential and future prospects of Chinese provinces, regions and cities as China enters the new era. For the inaugural event of the year 2018 under the theme of "China in the New Era", the Ministry of Foreign Affairs and the People's Government of Hainan Province will jointly hold the promotion event themed China in the New Era: Beautiful New Hainan, Shared New Opportunities on the third floor of the MFA South Building at 3:30 p.m. February 2. Foreign Minister Wang Yi will address the event. The Party Secretary of Hainan Province Liu Cigui and Governor Shen Xiaoming will respectively deliver speeches and presentations. Foreign diplomatic envoys and representatives will also be here to make remarks and interact with other guests. This year marks the 30th anniversary of Hainan's status as a province and a special economic zone. As the largest special economic zone and the only provincial-level international tourism island in China, Hainan province is leveraging its strength to speed up the building of a beautiful new Hainan featuring economic prosperity, culturally advanced society and good environment where people lead comfortable and happy lives. Hainan has made one achievement after another in actively participating in the Belt and Road Initiative and promoting the development of international tourism. We look forward to your participation in and coverage of this event. As a result, the regular press conference of the Foreign Ministry will be adjourned tomorrow afternoon. It will be resumed on February 5 (Monday). During the recess, the Foreign Ministry Spokesperson's Office will take your questions via phone call and fax as usual.